Vishwakarma Jayanti is an auspicious day dedicated to Lord Vishwakarma who is known to be the divine architect. Lord Vishwakarma is the creator of all the palaces of Hindu Gods and Goddesses along with their weapons and vehicles. The festival of Vishwakarma Jayanti is celebrated as the birth anniversary of Lord Vishwakarma every year. It is observed every year on the 16th or 17th of September as per the Gregorian calendar. The calculation of this day is done as per the ‘Bisuddhasidhanta’. Vishwakarma Puja is celebrated as ‘Biswakarma Puja’ on the last day of Bengali Bhadra month, in the eastern states of India like Orissa, West Bengal, Jharkhand and Tripura. It is also referred as ‘Kanya Sankranti’ or ‘Bhadra Sankranti’. Vishwakarma Jayanti is the most important and auspicious day for artisans and craftsmen all over the world. In some parts of the country, especially in Bihar and few northern states, Vishwakarma Puja is also observed after Diwali. It is celebrated in the month of ‘Magh’ as per the Hindu calendar. In the southern state of Kerala, Vishwakarma Jayanti, also known as ‘Vishwakarma Puja’ is held on the day of Rishi Panchami. On this day, various puja and rituals are performed in temples as well as workplaces all over the country. Vishwakarma Jayanti is celebrated with full enthusiasm and fervour by labourers, carpenters, mechanics, craftsmen and other workers. On Vishwakarma Jayanti, special prayers and puja are held in shops, factories, offices and workplaces. These places are beautifully adorned with flowers and wear a festive look on this day. On this day, devotees worship Lord Vishwakarma and His ‘Vahan’ (vehicle), the elephant. The idol Lord Vishwakarma is placed in decorative pandals where the main puja rituals are held. The families of the workers also participate in these rituals. The whole atmosphere is very fun and frolic. After the completion of puja, Prasad is distributed among all the workers. Workers also worship their tools on this day and the work remains closed for the day. On the day of Vishwakarma Jayanti a gourmet feast is prepared. It is eaten together by all, including the workers and the owners. In some regions there is also a tradition of flying kites on this day. The sky takes the look of a colourful warzone and everyone tries to cut each other’s kite in a very competitive spirit. Vishwakarma Jayanti holds immense religious significance for Hinduism followers. This day is celebrated in the honour of God Vishwakarma, the divine carpenter and architect of this universe. He is also the son of Lord Brahma. The greatness of his works is mentioned in the Rig Veda and Sthapatya Veda, which is the science of architecture and mechanics. 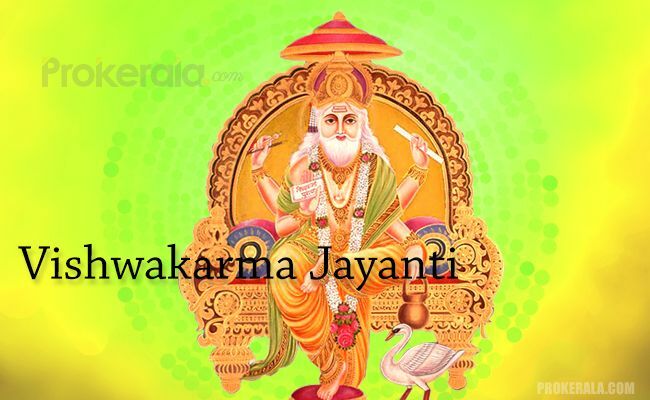 Vishwakarma Jayanti is day of great importance for the worker community. They pray to Lord Vishwakarma on this day for success in their respective fields, along with smooth and safe working of the machines. The craftsmen worship their tools on this day and refrain from using it on Vishwakarma Puja. It is therefore a holiday for them and free lunched are organised for them, in many places.